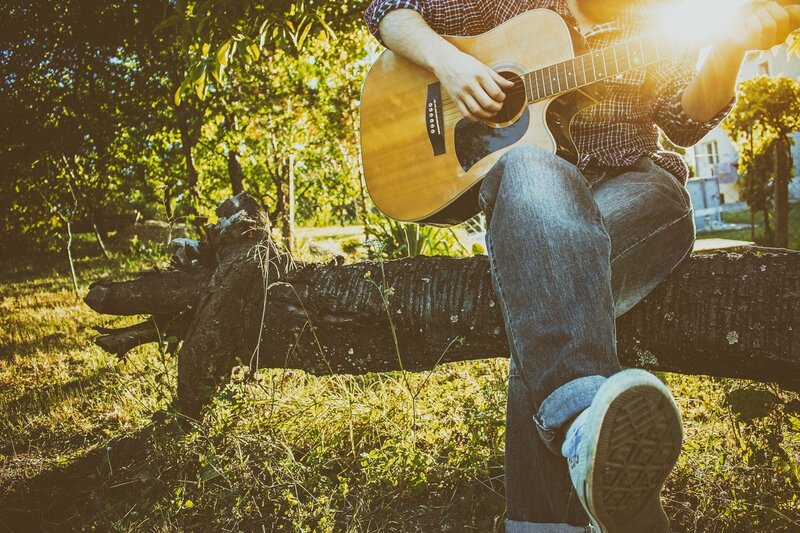 While you should always buy a guitar that fits your personal, unique style, it definitely helps to know what styles and models work well for others—especially famous guitarists who manage to do extraordinary things with ordinary instruments. If you love the music that any of these guys produce, it’s a safe bet to copy their guitar choice for yourself. 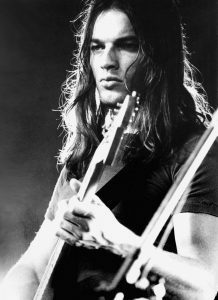 What Guitar Does David Gilmour Use? The lead guitarist and singer for Pink Floyd has played a number of guitars over the years at shows and in recording sessions, but he’s probably best known for playing the Fender Stratocaster. In the 1970s he primarily used a ‘69 Fender Stratocaster with a black finish and matching black pickguard. In the mid 1980s, David replaced most of his guitars with Fender Stratocaster ’57 reissue models and continued to play this style through the post-Roger Waters era with Pink Floyd. Of those, his Strat ’57 reissue with a candy apple finish, white pickguard, and maple neck was definitely the most famous. His 1969 Fender Stratocaster adorned the wall of the Dallas Hard Rock Café for years until David requested it back in 1997, and he’s since rotated it back into his arsenal. He did have one notable guitar outside of the Fender Strat family, though. While composing his first solo album, “The Wall,” David used a ‘55 Fender Esquire that he nicknamed “The Workmate.” It had a custom-fitted neck pickup designed by Seymour Duncan, and it got its name from its worn-down looks. What Kind of Guitar Did BB King Play? There aren’t too many guitarists whose axe of choice has been named after them, and of that small group, BB King’s Lucille may be one of the most widely known. 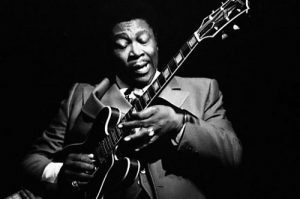 Early in his career, BB King played variants of the Gibson ES-335 (especially the ES-345 and ES-355). In 1980, Gibson Guitar Corporation launched the BB King Lucille model (aka the Gibson Lucille). It was based on the Gibson ES-355, with “Lucille” inscribed into the headstock, a maple neck, and no F-holes on the top (which BB King personally requested to reduce feedback). Gibson produced the standard Lucille from 1980 – 1985. Today, Epiphone (a subsidiary of Gibson) produces the BB King Lucille. If you’re like me, you’re probably asking yourself, why “Lucille?” It’s actually a pretty interesting story. In 1949, BB King was playing a winter show at a dance hall in Twist, Arkansas. During his performance two men started fighting, and in the process, they knocked over a barrel with burning kerosene (apparently that’s how they heated dance halls in the 40s). The dance hall was quickly engulfed in flames, and everyone was evacuated. Once outside, King realized he had left his beloved $30 Gibson guitar inside, so he ran back into to the fiery building to retrieve it. The next day he learned that the men who started the fire were fighting over a woman who worked at the bar named Lucille. To remind himself never to do anything that stupid again (to run into a burning building, or fight over a woman), he named all of his guitars Lucille from then on. 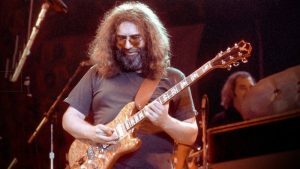 What Kind of Guitar Did Jerry Garcia Play? Wolf – Doug Irwin Commission, played from 1973 – 1993. 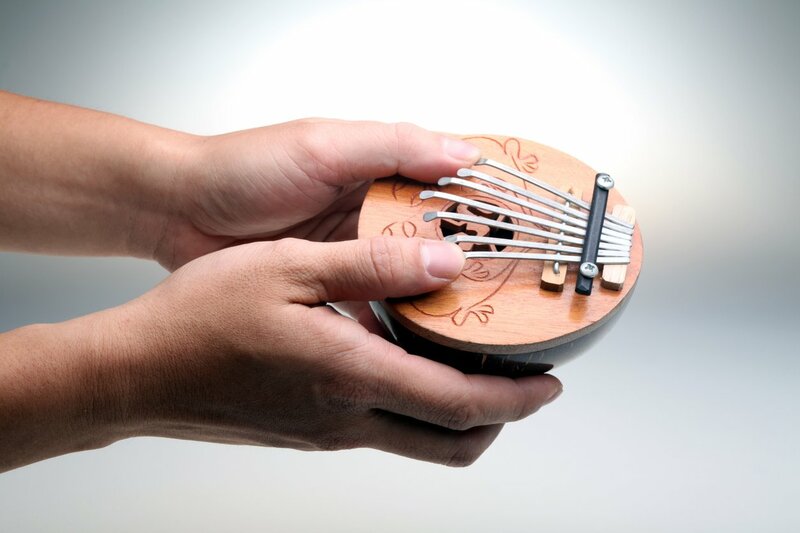 It was made from purple heart and curly maple, with an ebony fingerboard and 24-frets. The first iteration had a peacock inlay but was later swapped out for Irwin’s eagle logo. Jerry slapped on a cartoon sticker of a bloodthirsty wolf, and the image was later inlaid in the body by Irwin. Tiger – Doug Irwin Commission, played from 1979 – 1995. The guitar had a tiger inlay just below the tailpiece, solid brass binding and hardware, with several layers of heavy woods (maple, vermillion, cocobolo) laminated together face-to-face in a configuration known as the “hippie sandwich.” This was arguably Jerry’s favorite guitar thanks to the wealth of incredible sounds it could produce. 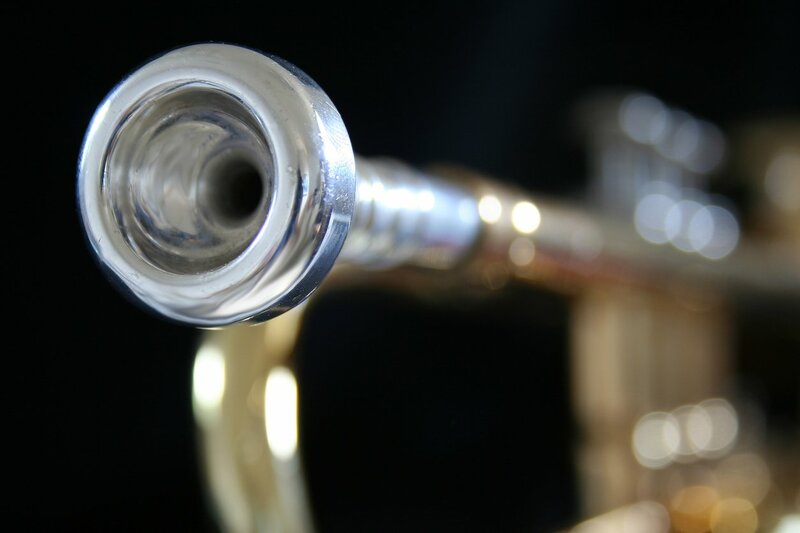 Rosebud – Doug Irwin Commission, played from 1990 – 1995. Rosebud got its name from the inlaid dancing skeleton on the cover plate. Doug Irwin called it “The Saint,” but Jerry named the skeleton “Rosebud” (most likely a reference to Citizen Kane). Rosebud is essentially Tiger’s twin other than its hollowed-out flame-maple core. Lightning Bolt – Stephen Cripe Custom Guitar, played from 1993 – 1995. This was Cripe’s first custom guitar, and he built it entirely by feel. He used recycled Brazilian rosewood for the fingerboard, and the neck was specially crafted in the higher end to aid Jerry’s play. The body was made of reused East Indian rosewood—ironically, it came from a bed used in an Asian opium den. The guitar got its name from the special inlay that Cripe designed. 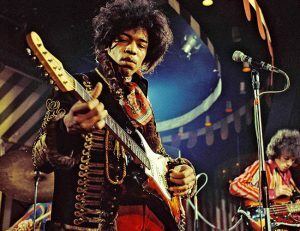 What Guitar Did Jimi Hendrix Use? 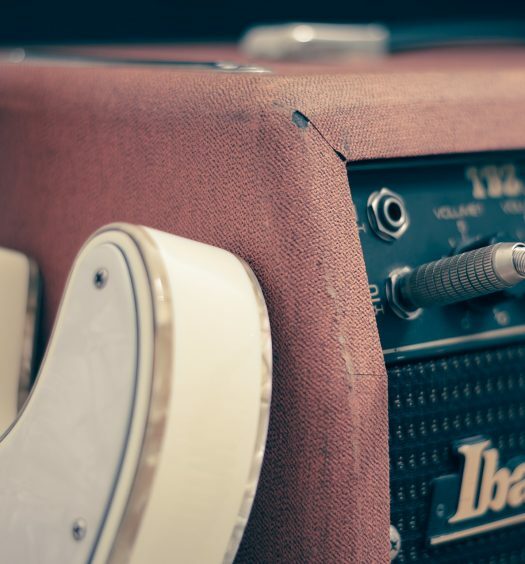 Even though his mainstream career only lasted four years, Jimi Hendrix is widely regarded as one of the greatest electric guitarists of all time. His signature guitar was the Fender Stratocaster, with his favorite being a black ’68 Fender Strat with a maple neck. He played some Gibson Flying Vs and Les Paul Customs towards the end of his career, but the Fender Strat was definitely his signature axe. What Kind of Guitar Does Ed Sheeran Play? 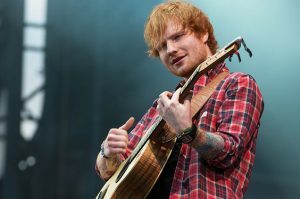 Ed Sheeran is predominately an acoustic guitarist, and he almost exclusively plays acoustic guitars made by the American brand C.F. Martin & Co. (Martin). He started playing the Martin LX1E, though now he plays his signature guitar—the Martin Ed Sheeran Divide. Both are small-scale dreadnoughts that, despite their smaller size, produce a bold and volume rich tone. When he needs to play an electric guitar, Sheeran is usually seen using a Fender Stratocaster. What Guitar Does John Mayer Use? 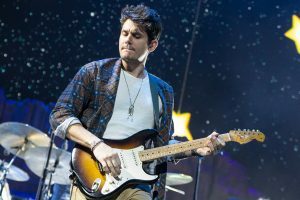 John Mayer has an amazingly versatile arsenal of over 200 guitars, but the Fender Stratocaster is hands-down his signature electric guitar. 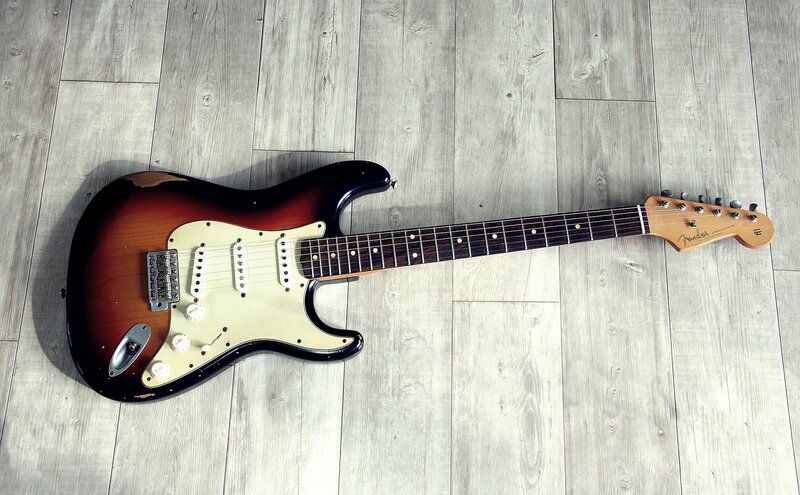 He even partnered with Fender to produce the John Mayer Strat from 2005 – 2014. Within the Stratocaster family, he is often seen playing an SRV (Stevie Ray Vaughn) Signature Strat. 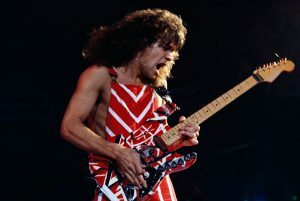 What Kind of Guitar Does Eddie Van Halen Play? Eddie built his own guitar in 1974, and given the name you can imagine the beast pulled parts from a number of other guitars. 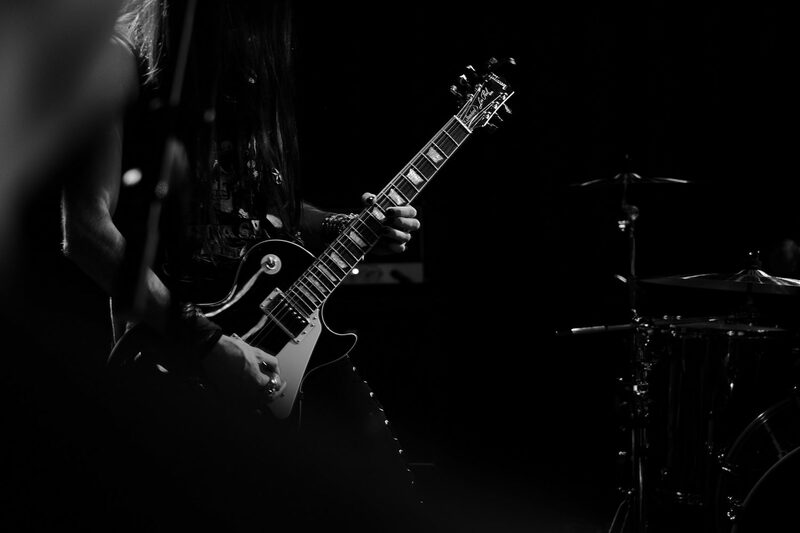 He bought a factory second unfinished body and neck from Boogie Bodies (whose parts were used on early Chavels), paying special attention to the neck, picking one that had a thin profile with big Gibson-style frets. He used a Fender tremolo from an old ’58 Stratocaster, Schaller tuners, and a Gibson PAF pickup from his old ES-335. He dipped the pickup in paraffin wax to get rid of the feedback, and he gave the guitar its classic black & white stripes with some crafty use of masking tape. For a touch of class, he also slapped a Gibson decal to the headstock. 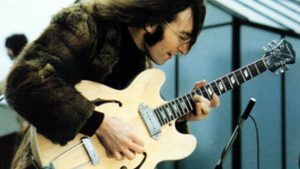 What Guitar Did John Lennon Play? ’58 Rickenbacker 325 Capri – this is the guitar John played in the Beatles’ first performance on the Ed Sullivan Show. ’62 Gibson J-160E – quite possibly John’s most recognizable acoustic guitar with its sunburst finish. ’63 Rickenbacker 325 – when John’s Capri couldn’t take any more of a beating, he replaced it with this model, black with a white pickguard. 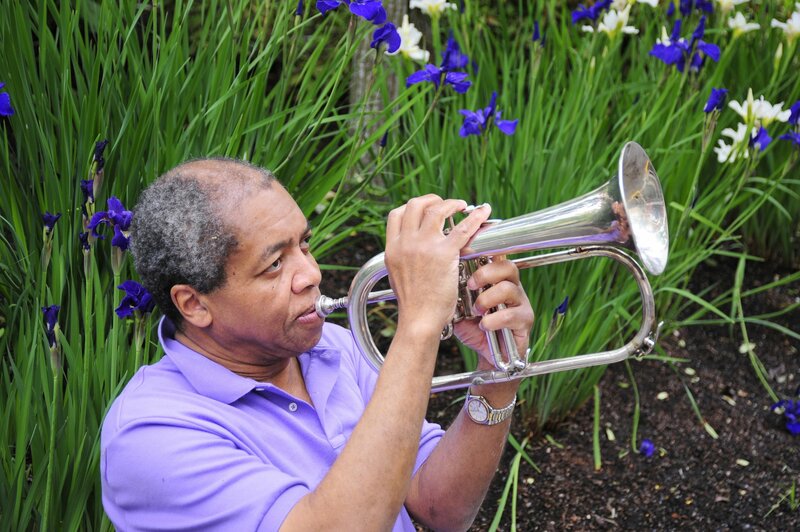 He played it on the Beatles’ second performance on the Ed Sullivan show. ’61 Fender Stratocaster – both John Lennon and George Harrison started playing the Fender Strat in 1964. John’s was a light blue Strat with a rosewood fretboard. ’65 Epiphone E230TD Casino – this is the hollow-bodied guitar that John played in the impromptu rooftop concert. It was originally a sunburst finish with a white pickguard, then John sanded it down to its natural finish in 1968. 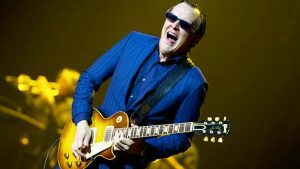 What Kind of Guitar Does Joe Bonamassa Play? Joe has one of the greatest guitar collections in the world, so it’s hard to narrow it down to one. But of all the axes in his collection, his ’59 sunburst Gibson Les Paul is his favorite, and he plays it every night.